A patent application by telecoms giant AT&T details a traffic management system set to add a little more heat to the net neutrality debate. Rather than customers using their Internet connections to freely access any kind of data, the telecoms giant envisions a system in which subscribers engaged in "non-permissible" transfers, such as file-sharing and movie downloading, can be sanctioned or marked for increased billing. When a consumer subscribes to an Internet package, either at home or on a cellphone, it’s generally accepted that he can use it for whatever applications he likes, whether that’s web browsing, sending or receiving emails, watching video, or listening to music. Of course, bandwidth is a finite resource so it is fairly common for service providers to put a cap on data transfers in order to manage their services. For example, a user with a 3GB per month limit on a cellphone contract might use it all in the first couple of weeks watching YouTube, and as a result might need to consider upgrading to a more spacious package. Fair enough, but what if a service provider started to dictate what types of data could be accessed each month on a particular package? What if emails and web browsing were acceptable kinds of traffic but others, such as video downloading and file-sharing, resulted in subscribers being subjected to penalties? A new system developed at telecoms giant AT&T appears to envision just that kind of scenario. The system is revealed in a patent filed by AT&T Mobility in September 2013 and published this month. 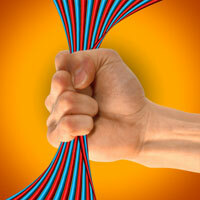 Its stated aim is to stop customers from “abusing a telecommunications system” by consuming too much bandwidth. Titled “Prevention Of Bandwidth Abuse Of A Communications System”, the patent is likely to get net neutrality advocates hot under the collar as rather than targeting bandwidth consumption overall, it seeks to penalize the transfer of certain kinds of data linked to “excessive” consumption. “When a user communicates over a channel, the type of communication is checked to determine if it is of a type that will use an excessive amount of bandwidth,” the patent reads. The system works by awarding the subscriber with “credits” and subtracting from those when monitored traffic is deemed to have been consumed in potentially bandwidth-hungry fashion. “The user is provided an initial number of credits. As the user consumes the credits, the data being downloaded is checked to determine if it is permissible or non-permissible. Non-permissible data includes file-sharing files and movie downloads if user subscription does not permit such activity,” the patent application reads. “If the data is permissible, the user is provided another allotment of credits equal to the initial allotment. If the data is non-permissible, the user is provided an allotment of credits less than the initial allotment,” it continues. By marking some traffic type usages as acceptable and others not, the system described by the patent application can develop in a couple of directions. The subscriber can remain in “credit” and continue about his Internet activity as usual, or find that his “credits” are diminishing towards zero. At this point he can be asked to pay more money, be subjected to sanctions that affect his ability to communicate (such as by blocking movie downloading), or be incentivized to maintain preferred consumption habits. “Various restriction policies also can be applied, such as levying additional fees and/or terminating the user’s access to the channel. Also, incentives can be provided to entice the user [to] curb the misuse,” the patent filed by AT&T Mobility Ii Llc adds. Earlier this month a federal appeals court in Washington struck down the Federal Communications Commission’s net neutrality rules. Shortly after AT&T CEO Randall Stephenson offered reassurances that his company was committed to an open Internet. Where legitimate traffic management ends and the open Internet begins will become apparent in the months and years to come. c There are 366 comments. Add yours?